Lotus Exige S2 extended rear diffuser 4 Fin GT3 replica Extended by 75mm Aluminium co..
Lotus Elise S1 extended rear diffuser. Extended by 140mm over OE item. Aluminium construc..
Lotus Elise Exige S2 Rear Diffuser. 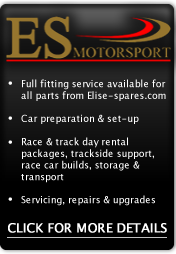 To suit Rover engined model and Toyota engined models wit..